It’s that time of year again. Creepy crawlers, ghouls, and zombies emerge from the darkness and into our living rooms. With leaves falling from trees and a howling wind brushing a tree branch against your windowpane, it is time to sit back, relax, and discover Halloween all over again. There are five Halloween classics you can stream right now on Netflix. And we are here to tell you what they are and how you can optimize the scare factor. The top horror movies on Netflix are those classics that can still invoke a certain fear that is felt deep in the pit of your stomach. They are the kinds of movies that make you — albeit secretly — check your closet and under the bed before you turn out the lights for a night’s sleep. Stephen King’s short story manifests into a nightmare for adults. From that opening scene in the cafe to the moment terror fully takes over. Relive this classic again — if you dare — on Netflix throughout October 2018. But if something more horrific and bloody sewn from details of a true-life murderer is what interests you, then Texas Chainsaw Massacre may be the thing for you. Whether it is the original version or the updated version, there is enough gore to make everything look red. If you want something that causes you to ball up into a fetal position and try not to watch while watching, then this psychological scary movie is one you need to watch on Netflix tonight. An exhausted mom and her overactive kid take on Mr. Babadook, something akin to a strange character in a pop-up book. Based on true events, this movie takes you inside the real-life story of the Perron family in Rhode Island. The movie is enough to make your heart stop at moments only to race away the very next minute. Starting the list and ending the list of top scary movies on Netflix is Stephen King. The Shining is indeed a classic. It is a smart scary movie that does not require blood and guts and shock to instill fear. Indeed, after watching this movie, there are things — or feelings — that will stay with you well after Halloween has come and gone. Let’s not forget about the kids! Here are some of the most popular Halloween flicks that are available for stream on Netflix through October 31st. Now that you know the best horror movies on Netflix, how do you best experience those movies at home? The answer is simple: reliable, high-speed internet service. Reliable means knowing once you turn on your scary movie, it won’t be interrupted by internet service failures. Reliable means having enough data available to stream the movie without fear of exceeding your monthly limit. Reliable means knowing you won’t be disturbed by buffering while you try to watch your movie. At Phoenix Internet, residential fixed wireless internet services are offered at high-speed rates with no data caps. In fact, you get the option of three different speeds and services, all of which — including the minimum speed — supports streaming videos online. There are many horror movies out there, but they aren’t all classics and they are not all available through streaming services. Fortunately for you, streaming now are five classic Halloween movies, including our top scary movies on Netflix. Watching one of these top horror movies on Netflix can be distracting if the internet service is not reliable. 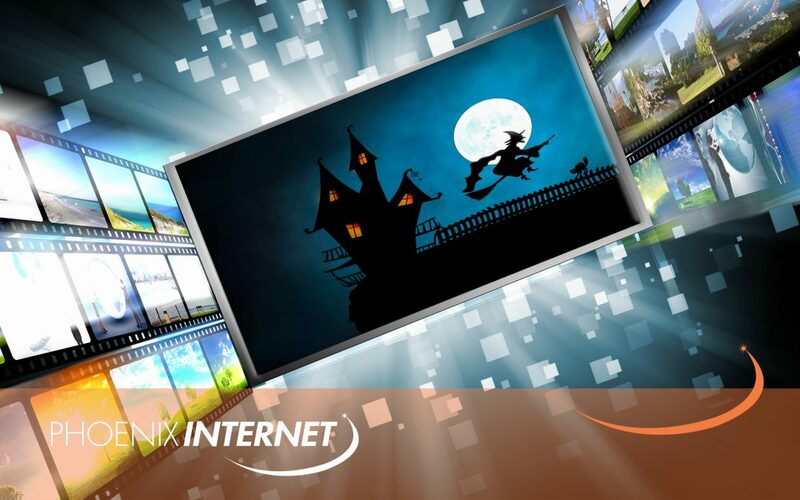 To experience Halloween movies at their best, you need reliable internet, and that means using an internet service that offers fixed wireless, no data caps, and high-speed options. Before Hallow’s Eve, sit back and turn on your smart TV to watch one of the top horror movies on Netflix. But first, make sure you have reliable internet service; anything else is enough to scare you out of your seat before the first scream breaks out.